Cripple Bastards : La Fine Cresce Da Dentro album download | Has it Leaked? 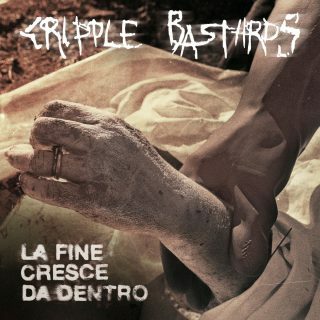 Italian grindcore legends CRIPPLE BASTARDS celebrate 30 years of misanthropic extremity with their seventh full-length album La Fine Cresce Da Dentro (Meaning “The End Is Growing From Within”). Recorded at the legendary Fredman Studios in Gothenburg, Sweden with producer Fredrik Nordström (At The Gates, Dark Tranquility), La Fine Cresce Da Dentro is eighteen tracks of inconceivable speed and brutality surpassing even their previous work. Over three decades in, CRIPPLE BASTARDS are showing no signs of slowing down and continue to destroy unsuspecting eardrums with hate-filled, grind punk chaos!. Are you a fan of intense heavy GRIND? If yes – then you are going to get hyped for the new release from Cripple Bastards. Relapse Records will be unleashing their new LP La Fine Cresce Da Dentro on November 9th, and today we’re BEYOND stoked to be sharing their new visual for “Passi Nel Vuoto.” Pre-order La Fine Cresce Da Dentro right here, and right now you can hit play and allow this sick video from Cripple Bastards TAKE OVER YOUR MIND! The song ‘Passi Nel Vuoto’ (translated to ‘Steps Into The Void’) is a parallel between the annihilation of the individual lost in the most obtuse massification, induced to waste and sedated in his emotions, and the value of life increasingly low – reduced to being a cog in the consumer machine. The graphics of our new album La Fine Cresce Da Dentro are all unreleased pictures taken from the vaults of a crime magazine that existed from the 1950s through the 90s, accessed from the archives of the criminal police based in Milano, Italy. In making this video we have chosen to alternate similar photos with scenarios of mass stratification and blind conformism. As the lyrics say, ‘What’s left is desolation / but it doesn’t make sense to realize it / it’s the weight of survival: how much you spend / how much you can cost’.